Living Coasts, Torquay’s coastal zoo, makes a splash with play time for new pup. Her new toy was custom made by dry suit manufacturers O'Three Ltd. of Portland, in Dorset. Kiesha Summers, from O'Three, explained: “We supplied Living Coasts with dry suits. When we came to visit, both the penguins and Gemini were fascinated by the neoprene hoods – and this gave us an idea. Our clever seamstresses covered a football in 1.5mm double lined Neoprene with a small Velcro opening for a pump. 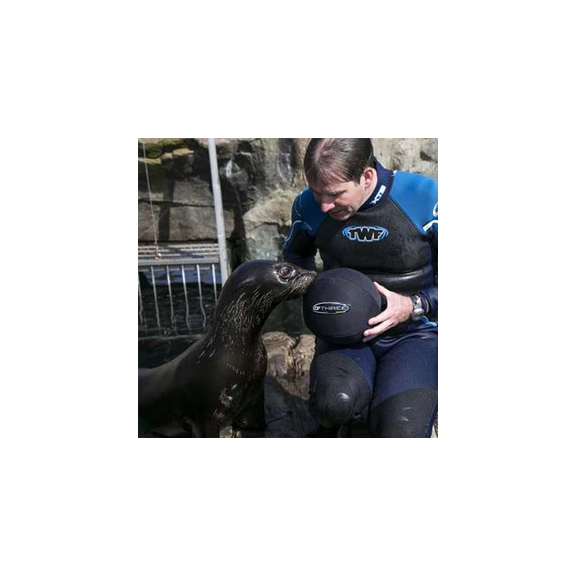 ”Living Coasts Operations Manager Clare Rugg said: “Gemini and Lee are very pleased. She – and he - loves new toys!” Gemini, born on 3rd June 2014, was hand-reared because her mother was unable to produce milk and had to be taught how to swim by zoo keeper Libor Mach. For more information go to www.livingcoasts.org.uk or ring 01803 202470.